The left hand motion bracket is now bolted to the chassis and is in the course of being painted. Machining of the brake hanger brackets continues as does the grinding of lubrication grooves in the manganese liner plates for the horn blocks and guides. 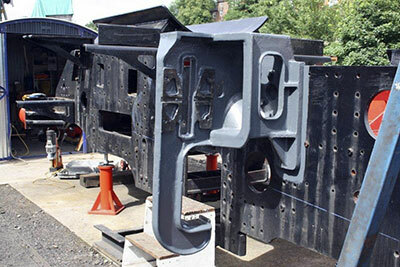 As mentioned last month temporary dismantling of the various stretchers has taken place at the front half of the chassis to permit a thorough cleaning of the joint faces. This is proving to be a well worthwhile excercise as some rusting has begun in various areas. At the time of writing just the smokebox saddle is in situ at the front end. This will also be removed, cleaned and refitted. The rear end of the chassis will be similarly tackled in due course. We have been in recent communication with the foundry that will be casting the cylinders and understand that the pattern making is underway. We are at a particularly interesting stage of the project as July draws to a close. Wearing his miser's hat, Chris has his work cut out on several fronts; namely, conserving the funds for the cylinders (this expenditure is already committed), while ensuring that as much money as possible goes to the Wheel Appeal and at the same time keeping enough in reserve to pay for day to day outgoings. The fact that our finances have been organised into a number of sequestered pots - wheels, cylinders/motion, boiler, as well as a general account from which cheque payments are made - is proving very helpful in his forward planning. A conservative cashflow projection made on 28th July indicates that sufficient finance to pay for the casting of all six driving wheels will be in place by the late summer of 2013, a date which could well be brought forward, given a favourable wind. We can anticipate that the far less costly acquisition of tyres and axles will follow on fairly quickly after this, so that we can prepare for the next major outlay: the machining and assembly of the driving wheel sets ready for delivery to Bridgnorth for fitting to the chassis. 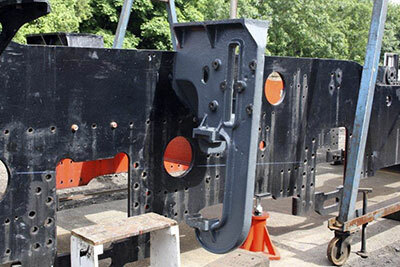 At the present rate of progress, there is no reason why a 2-6-2 rolling chassis should not be in situ by mid-2014, leaving the door open for a concerted fund raising campaign to finance the boiler. Strategic financial planning is essential for the continued well-being of the project. It has been said before (on several occasions) that one of the most valuable weapons in our armoury - along with the huge amount of skilled volunteer labour we are lucky enough to be able to call on - is the monthly standing order, almost literally the bedrock on which 82045 is being built. The regular income thus provided enables Chris to plan ahead with a high degree of accuracy and ensures that we know exactly what we can afford, and when we can afford it. Many, many thanks to all those readers who are already supporting the new loco in this way; and to all those who have not yet decided to join us, please consider setting up a standing order and becoming part of this flourishing project. We do not claim to be building a glamorous express engine - others are doing that very effectively, and good luck to them - but for sheer pragmatic usefulness, 82045 surely cannot be bettered. The recently cast and machined left hand motion bracket bolted to the chassis. You can help The 82045 Steam Locomotive Trust to raise money whenever you shop online. It's very simple - just visit: www.easyfundraising.org.uk/causes/82045slt/ to register and shop with over 2000 well known retailers like Amazon, Argos, M&S, eBay and many more. Whenever you buy something, the retailer makes a donation to The 82045 Steam Locomotive Trust. They've helped other causes raise over £2,000,000 so it really does work. We'd be really grateful if you could use easyfundraising. It won't cost you a penny extra to shop through easyfundraising and you can even save money with special offers and voucher codes. So please make a difference to The 82045 Steam Locomotive Trust and take a look at easyfundraising today.